Another Operation Kindred Spirit? Probably Not. Having been given the opportunity to see Dr. Gawande give a talk yesterday, in Harvard Square’s very own First Parish Church, I couldn’t help but realize how big this this might actually be for the subject area I have been working in for the last few months. Dubbed as the forthcoming “Silent Spring” of this topic area, Gawande’s Being Mortal might really make an impact in opening public interest in the subject of Pain Control and Palliative Care. I helped organize the launch of the Harvard Global Equity Initiative – Lancet Commission on Global Access to Pain Control and Palliative Care, held about two weeks ago in NYC. It is important to me to make the differentiation between a small group of prestigious academics and dignitaries actively discussing the area where they’ve dedicated much of their careers, versus the average member of society on the street who doesn’t have a strong conception of what palliative care even means.. and Gawande may have the power to change that. While Gawande’s book primarily deals with moral and ethical questions that have long been considered separate from “hard” medical advice, he’s also talking about the demographic shift – the idea that as lifespans increase, the demographic make-up of our population doesn’t quite match what it used to. In other words, many more elderly people are making up society than ever before. This is an important concept in epidemiology and public health, as different ages are prone to different illnesses and diseases. In this case, older people are more susceptible to chronic illnesses such as cancers and cardiovascular disease. Pain Control and Palliative Care is an important topic area that affects people all around the globe. In my work sphere at the Harvard Global Equity Initiative, we emphasize the gross disparities in opioid distribution and access. On the other hand, you have Atul Gawande, a surgeon in his own right, proclaiming that the U.S. doesn’t even distribute enough of these medications – last night using the anecdote for a man who had to actively make the decision to rebuff formal medical care in order to receive the amount of medication he needed. At first take, does this not seem to contradict the access argument? 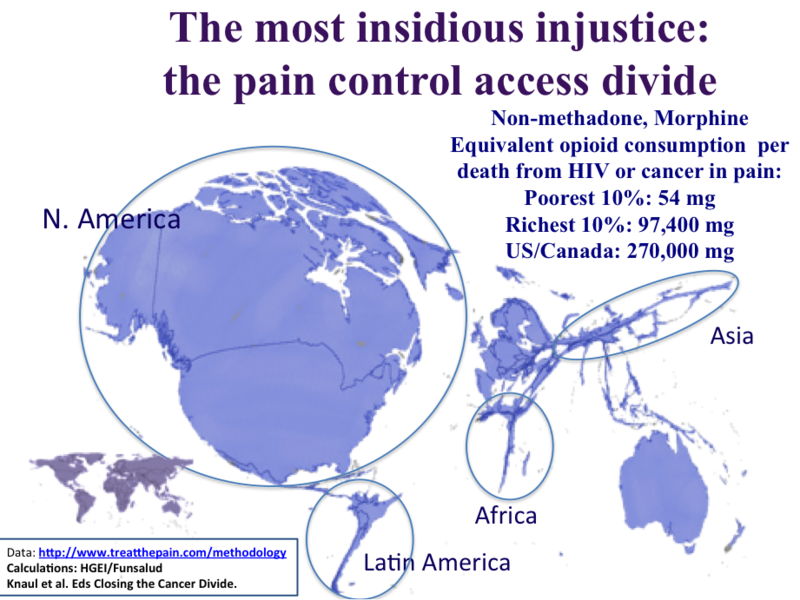 If we are pushing a map of countries, proportionally inflated based on the amount of pain medication distributed (see image courtesy of HGEI), are we not arguing that the bloated figures of the U.S., Canada, and Europe have sufficient access, when compared to their less wealthy, less developed counterparts? Thanks Torrey, I have reblogged this on palliverse.com, hope that is OK!